9″x12″ mixed media painting on a wood cradle. The sides are 1.5″ deep and are red. I have spread my dreams under your feet;Tread softly, because you tread on my dreams. This entry was posted on June 6, 2013 by mpwynters. It was filed under Uncategorized and was tagged with art, arts, children, dreams, flowers, girl, inspiration, joy, Maria Pace-Wynters, maria pace-wynters. 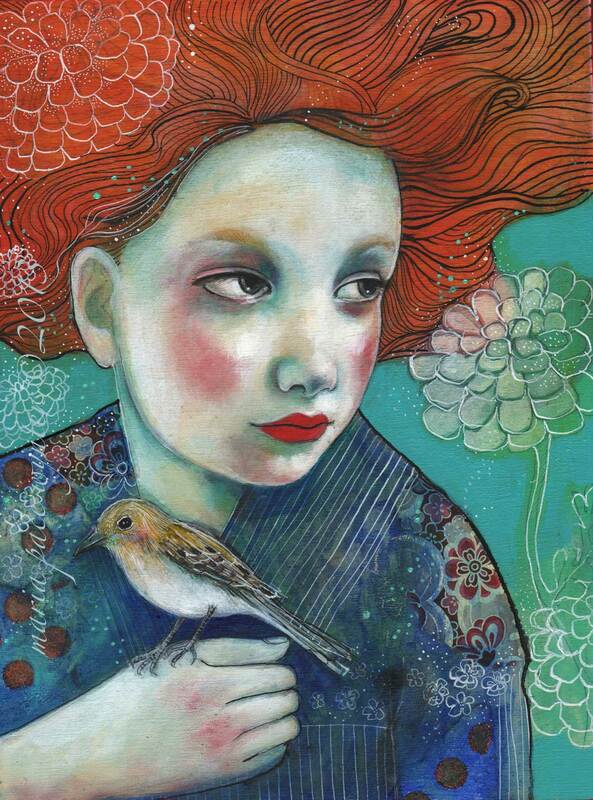 mixed media, mixed media painting, original art, original painting, Pace-Wynters, Painting, painting for sale, red hair, redhead, turquoise. Beautiful piece and a great bit of poetry to go with it. Did the poetry inspire you? Sometimes I do but this time I found the quote after I did the painting. I thought it fit, so I used it. Thanks for looking! Beautiful! May I ask where you get stone paper?